Park Heng-gyu, the president of the Cheongsan Forestry Farm Corporation, is a highly respected man in the field of forest management. He laid the foundation for complex forest management through continuous research on painted maple (acer mono max). He was appointed as a new intellectual in the category of forestry industry by the Korea Forest Service in 2006 and another appointment as an honorary researcher of the same organization. He also is the one who first received the Order of Industrial Service Merit in the category of the forestry industry. "The sap of painted maple is produced by filtering of millions of cells. We can drink it as water and its added value is great. That's why I chose painted maple as a promising future business" says Park. Park traveled far and wide including Russia and Canada to find quality painted maple trees and succeeded cultivating a number of kinds in the Korean soil with okamotoanum as the main product. Okamotoanum has more sugar content and has saponin which is the reason to create ginseng smell. But his innovation came when he succeeded collecting the sap after 5 years; it was extraordinary result considering the fact that it normally took 10 years. Also, he planted wild ginseng and deodeok (codonopsis lanceolata) between the trees to harvest extra income and the result turned out to be a great success. Today, tens of thousands of wild ginseng is planted in his farm and they are more than 10 years old. "It is called wood-cultivated ginseng and I took the initiative to spread the products by serving as the president of the Wood-Cultivated Ginseng Growers’ Association. We have a lot of work to do since the distribution system of the product is not yet modernized." Rolling up his sleeve, Park made a contribution to establishing an act to ban the circulation of unapproved wool-cultivated ginseng; it must be marked with details of the origin and production. Park was appointed as the first new intellectual in the category of forestry industry by the Korea Forest Service in 2006 and it was the result of his 20 years of hard work in extracting the sap of painted maple trees. "Sapping the painted maple trees is really hard work which cannot be done by individual businessmen. So it is important that the government should provide support for fostering industry specialists alongside investment in building the necessary facilities." 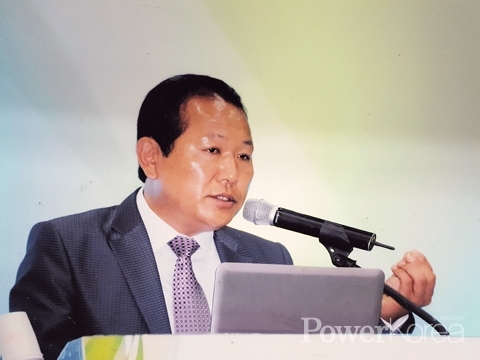 As part of this effort to promote the forestry industry as a whole, Park currently is serving as a special mentor and a lecturer of the Korea Forestry Promotion Institute started from 2017. "The German government provides differentiated support and compensation to the forestry workers who have been carrying on the business for a certain amount of time through the direct payment system. Korea also is urgent to adopt this system if we are to promote the industry." Meanwhile, Park is working hard with his family to grow mountain garlic and aralia alongside the painted maple and wood-cultivated ginseng on his 595,041 square meter farmland. You can see his products at renowned marts nationwide.